On tomorrow morning’s Expanding Awareness show, Victor’s topic with his guest will be “an explanation for psychic phenomena”. Tune in at 10am to WZBC 90.3fm or wzbc.org. If you miss it, you can also listen after the fact by visiting the WZBC Archive (all of ‘ZBC’s shows are online for two weeks). After a week of hellish transition from night worker to day, I’m finally back amongst the living, ready to enjoy life’s simple pleasures – dinners not in front of a computer screen, the occasional evening out to see a band, and the novelty of actually sleeping when it’s dark out. Meanwhile, The Airborne Toxic Event have been in a whirlwind of their own, revving up to introduce the world to their new album, All At Once. 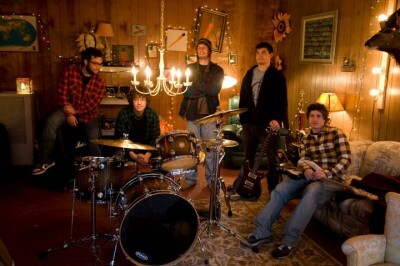 Since first hearing Airborne’s music in January ’08, it’s been fascinating, exciting, humorous, and at times a little harrowing to follow their steady ascent from indie band lugging their own equipment into small clubs to international artists on a major label, 300,000+ sales of their debut album, and multitudes of fans crashing their site in a desperate clamor for presale tickets (theairbornetoxicevent.com is down for the weekend as it gets moved to a larger server). There’s all sorts of cool stuff going on. The Origins Tour will see them playing 5-night marathon residencies in London, L.A. and NYC, starting from the smallest venue played in that city steadily moving to the largest, with a “secret show” for those who purchased season passes to all four [sorry, those special passes are all gone, but you can still get tix for select individual shows.]. Then there’s the new album, All At Once, with an April 18 release in the UK and Europe, April 26 in the U.S. The Bombastic video series – acoustic versions of all 11 songs from the album – are being released once a week leading up to the release date, and will be included in a special deluxe CD/DVD version of the album (along with the official videos for “Changing” and “Numb”). To top it all off, they’ve embarked on an eclectic and ambitious “Song Of The Day” series for the entire year on the band’s twitter, courtesy of Mikel. Anna, not to be outdone, has started her own “Book of the Week”. Awesome. That should keep everyone busy for a little while. 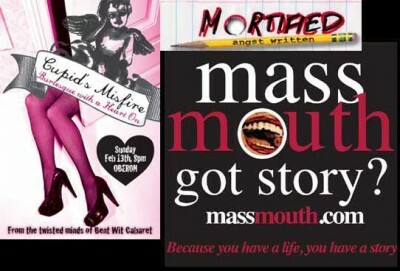 If you’re on that ‘anti-Valentine’s Day’ kick and are looking for an alternative way to get through the endless marketing hype for flowers, cards and chocolates, here’s some more suggestions for tonight and tomorrow – the ever-provocative Bent Wit Cabaret, with “Cupid’s Misfire”; massmouth’s “Ex-Files”, and Mortified Boston’s Doomed Valentines Show. For those of us not currently in warm, supportive relationships, there are a few events starting tonight to help cure whatever aspect of love’s bitter truth ails you. 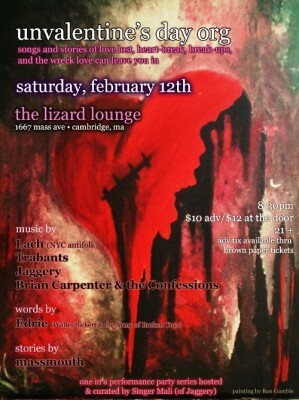 First up – unvalentine’s day org – “song and stories of love lost, heart-break, break-ups, and the wreck love can leave you in.” An evening of festivities at Lizard Lounge, hosted by Jaggery’s Mali Sastri (they’ll be performing), and also featuring Lach, Trabants, Brian Carpenter & the Confessions, words by Edrie (of Walter Sickert & the Army of Broken Toys), and stories by massmouth. Read more about it on Ryan’s Smashing Life. On this morning’s Expanding Awareness show, Victor will be discussing a magnetic polar shift which will have a significant influence on our weather patterns, and will also be presenting the case against cat declawing. There’s a double-feature for you. Tune in at 10am to WZBC 90.3fm or wzbc.org. If you miss it, you can also listen after the fact by visiting the WZBC Archive (all of ‘ZBC’s shows are online for two weeks). On this morning’s Expanding Awareness show, Victor will be playing Deepak Chopra reading from his Book of Secrets, disc 2 (disc 1 was aired last week and can be heard on the WZBC Archives). Tune in at 10am to WZBC 90.3fm or wzbc.org. If you miss it, you can also listen after the fact by visiting the WZBC Archive (all of ‘ZBC’s shows are online for two weeks). In part two of my band roundups, there’s Leftover Cuties, straight from the Cotton Club, with their charming song & video, “Game Of Live”. Sore Eros lays on some cool vibes (literally), and Scottish lo-fi folk artist Withered Hand makes his U.S. debut. 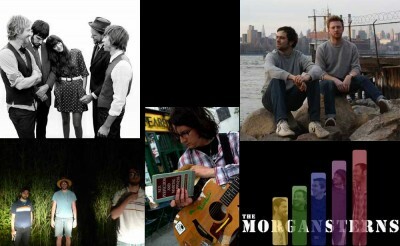 New Numbers harkens back to late 70s Bowie and Iggy – always a sound near and dear to my heart – and rootsy Los Angeles band The Morgansterns releases a warmly inviting debut on Microhits Music Corp.